Skateboarding is one of the most popular alternative sports around the world, for kids and adults alike. But before you hop on a board and take off, it’s important to choose the right kind of board for you. Most beginners will simply grab the board that they like the looks of, and with the endless array of deck art and styles that exist, that kind of attitude can lead to choosing a board that isn’t right to learn on. In this in-depth guide, we’re going to cover how to choose the best skateboard for beginners, and review the top five beginner skateboards on the market right now. We’ll talk about how to choose the right size, what parts of a skateboard you should pay attention to, how to choose the right shape, choosing the right wheels, and more. First, let’s talk about the top five skateboards for beginners. 9 What Type of Skateboard Do I Need? Powell Golden Dragon Complete Skateboard 4.5 $50-$60 Best grip and wheel roll. Stable and easy to learn with! Check on Amazon! 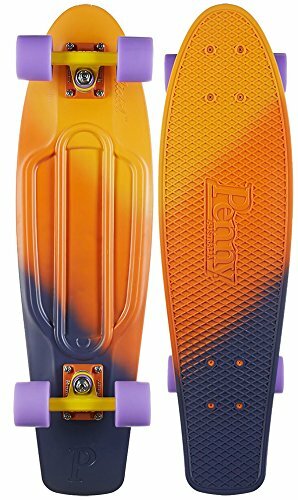 Penny Nickel Fade Complete Skateboard 4.5 $50-$60 Extremely portable. Fits in lockers and backpacks. Check on Amazon! 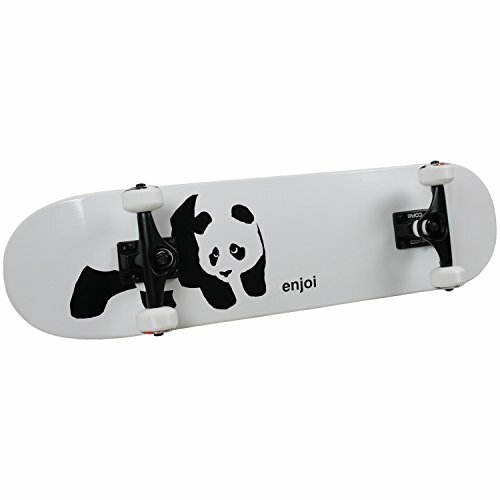 ENJOI Skateboards WHITEY Complete Skateboard 4.5 $70-$80 Best versatility for all types of surfaces. Perfect for the rider that wants a little of everything. Check on Amazon! Atom Drop Deck Longboard 4.5 $90-$100 Maximum stability, and great for long cruising. Check on Amazon! 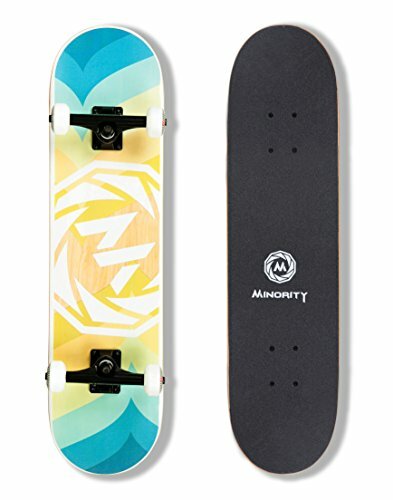 MINORITY 32inch Maple Skateboard 4.5 $40-$50 Strong, durable components that make the board safer for beginners. Check on Amazon! The Golden Dragon is a fantastic board for beginners, and it’s all in the wheels. The high-rebound polyurethane wheels are hand-cast and offer amazing grip as you ride, plus fantastic roll. The deck itself is just slightly longer than a standard skateboard, which offers a bit more stability for beginners, who might be worried about sliding or slipping off a shorter board. Additionally, this board features the All Powell-Peralta Ligament strap, an important safety feature that keeps the deck together if it should break. This helps prevent injury and provides a little more peace of mind for the rider. However, the Golden Dragon does have pretty soft trucks bushings, which means the board will lean very easily and be more responsive to weight distribution. This is good news for more intermediate skaters who want easy turns, but not necessarily great for those who are still learning and may not be familiar with controlling a board. But for the price, and considering the great durability of all the other components, this is a quality choice. If you want to be able to practice your new hobby anywhere and everywhere, the Fade is an excellent choice. 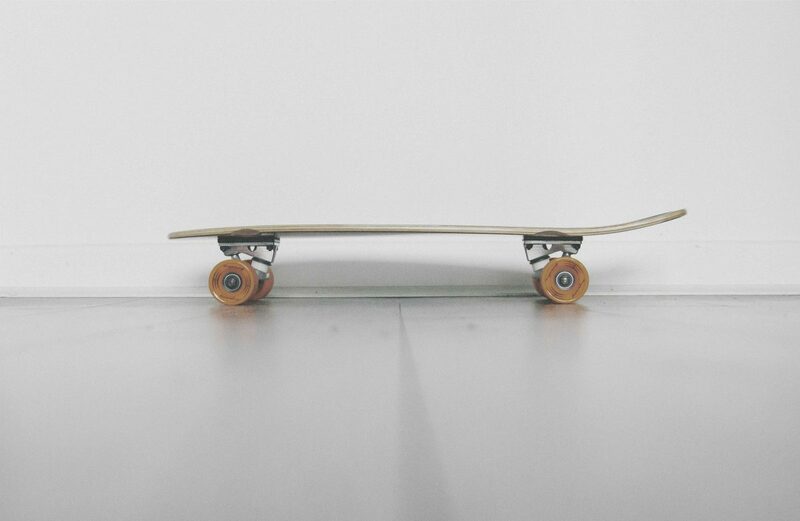 This is a short skateboard that measures only 27 inches long, made of lightweight (yet still durable) plastic. That means it’s easy to toss into a backpack and carry with you on your commute, to school, or anywhere. It’ll also fit into a locker at the gym or school quite easily. As with all penny boards, the Fade has a waffletop on the deck so that you have plenty of grip and stability as you ride. The plastic material of these boards is durable enough to withstand being run over, and the trucks and wheels are of similar high quality. This board is not made for the beginner that wants to skate downhill or do a lot of speedy skating – the short length makes it dangerous for that. But if you’re just interested in commuting and want something portable, this is a great choice. The ENJOI line of skateboards is made to professional standards, which means that not only are you getting a durable ride, but you’ll also get a skateboard made to handle a lot of situations. You can ride this board on the street, at the skate park, on trails, and more. These decks are made with a very consistent method that is ideal for trick riding, especially. If you’re a beginner and you want a board that gives you a little of everything to discover, you cannot go wrong with this ENJOI board. You get everything you need, all ready to go out of the box, and made with professional-grade components. 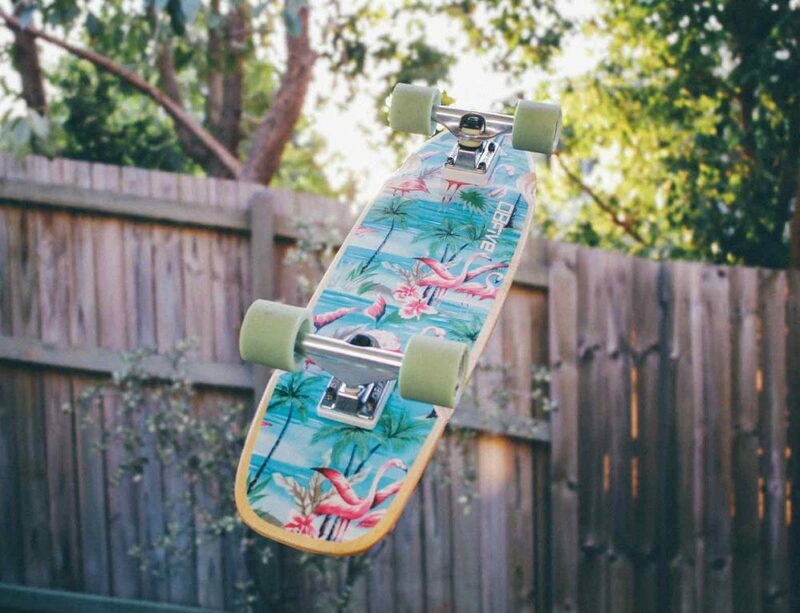 The ENJOI also earns points for having that classic cool artwork on the deck that makes it fun to show off at the park. If what you want out of your first skateboard is something very stable to just get the feel of riding without the danger, the Atom Drop Deck is perfect. This is a longboard, meaning it’s perfect for longer rides and cruising around. The components are made to handle lots of wear and tear, and the low-ride deck makes you feel more in control, closer to the ground, and more stable. This board also has a unique shape that makes it a lot easier to ease into turns, which is something that longboards aren’t always known for. It’s a lot easier to push off on this deck thanks to how low it sits, and you also get a one-year warranty from the manufacturer should anything go wrong. If you’ve never ridden on a board before, and don’t want to learn tricks right away, this is a great choice, especially if you’ll be riding around a lot of mostly flat areas. If what you want is the classic skate park skateboard that you see teens riding around all day, the MINORITY is the board for you. This is an extremely sturdy and durable board that can hold up to 220 pounds, and is made for trick riding especially. The strong trucks, medium concave shape, and high-rebound bushing all make this a fantastic board for ramps, pools, and street riding. This board is also a very smooth ride, and surprisingly offers plenty of stability as well, which makes it safe for beginners to learn with. Finally, it’s one of the few boards on this list that comes in a huge array of styles and artwork so that you can get the board that suits your style best. If what you want is a board that looks and performs like the boards you see at sporting events, this is the perfect choice. The only downside is that it’s not the most flexible board out there, which could make it a little harder to ease into turns – however, this feature is what makes the board just right for learning tricks on. There are multiple things to consider when you choose the best skateboard for beginners. First, you’ll need to consider the size of the skateboard. Most skateboards are about eight inches wide, but if you have very large feet, or you really want to feel very stable as you learn, consider going with something wider. Remember that the wider you go, the harder it is to learn tricks and to go around curves. If you want to rotate your board mid-air during a jump, you need a board that is no wider than eight inches. Keep in mind that the deck width will also affect the size of the trucks that you use. You’ll need wider trucks to make a wider deck more stable. If you see a wide deck with narrow trucks, you can expect the ride to be wobbly and hard to manage. Pay attention to the bushings on the board as well. If the bushings are very firm, you’ll have a more stable ride, but it also makes it harder to turn. Soft bushings are much more responsive, but you do lose a little bit of stability. If you don’t know if your bushings are firm or soft, you likely have soft bushings, since this is the default. Next, you’ll need to look at the deck material. Decks are typically wooden or plastic, but they may also be made of materials like carbon and fiberglass. Plastic boards, like the pennyboard, are more affordable, and still very durable, but many adult riders find that they can look a bit like a child’s toy rather than a “real” skateboard. Wood is the most popular choice for most skateboards, although if you want to invest in the pricier fiberglass or carbon options, you’ll get a very good quality deck for your money. The deck will also have a material on top called grip tape. This textured surface is what keeps your shoes from sliding all over the place as you ride. Look for a very high-quality grip tape for extra stability as you are learning, or something that is very visibly textured (like the waffletop from the pennyboard on our list above). You can also replace the grip tape if you love a board but don’t love the grip tape it comes with. The next thing to consider about your board is the shape. If the tail and nose of the board are slightly raised, this is called a concave board. It’s the most common shape of skateboard out there, and it is made that way to allow riders to do kick tricks. The deeper the concave, the more dramatic the tricks can be. However, the deeper the concave is, the less stable the board will be for beginners. If you are still gaining confidence on a skateboard, it is best to start with something less dramatic. A longboard is often completely flat, or nearly so, and that makes it better for cruising on a very stable surface. This is a great choice for riders who aren’t necessarily interested in learning tricks. Now you need to look at the wheels of your skateboard. There are dozens of different sizes, materials, shapes, and features of skateboard wheels, and it can get confusing for beginners. The most common type of wheel is a hard plastic wheel, and for beginners, you’ll usually see a “90a” level wheel. Professional skaters often choose even harder wheels, up to a 100a, because it gives them more “pop” for tricks. But somewhere between a 90a and a 97a is usually best for beginners. 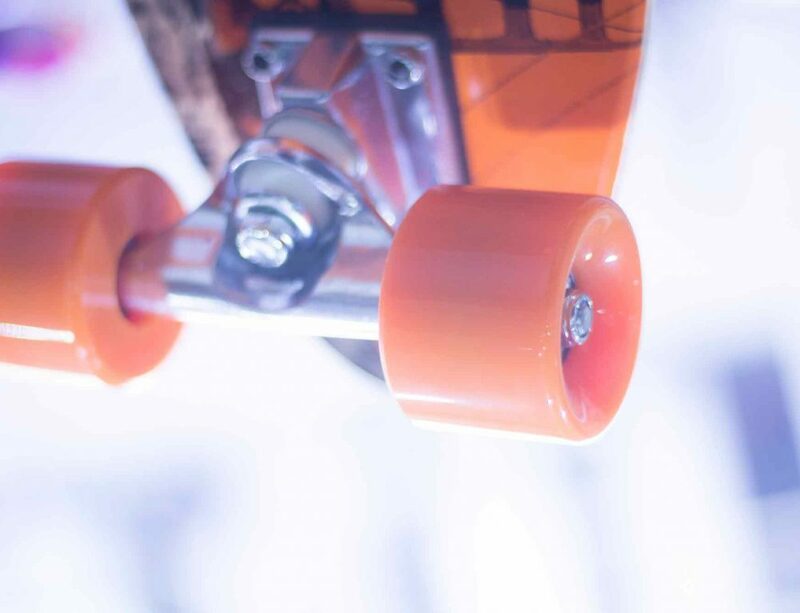 The smaller the wheel diameter, the easier it is to do tricks, because it makes the board sit closer to the ground. But beginners will definitely have an easier time controlling a board with larger diameter wheels. Think of the larger wheels as being akin to training wheels. If you don’t want your board to have “pop” as you are learning, you can choose softer wheels, all the way down to a 73a. They won’t let you go as fast, and you’ll have to push off more often, but they do make it more likely that your board will stay on the ground. What Type of Skateboard Do I Need? If you are a beginner, the best thing you can do before you buy a board is to ask yourself what kind of skateboarding you want to do. Do you want to go cruising around a mostly flat area for fun? A longboard may be the best choice for you. Are you interested in learning tricks and stunts? A double-kick skateboard may be the best option. A classic skateboard is perfect for the rider that isn’t really sure what they want just yet. Next, ask yourself what special features you need from a skateboard. Do you need a wider deck to handle your large feet? Do you want bigger wheels to make your ride more stable? 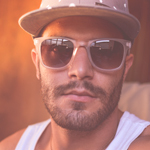 These things can help you narrow down your options within the category you choose. Our final tip for beginners that don’t know where to start is to simply choose a deck that is wider than most. The wider the deck is, the easier it will be to ride smoothly and easily. This is a great way to learn if you’ve never been on a board before.